»M99 is a one-stop shop for the urban revolutionary. 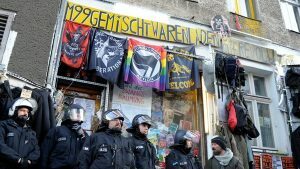 For the last 30 years, Germany’s hard-left activists have gone there to stock up on the tools of their trade — gas masks, cans of pepper spray and black balaclavas. Mr Lindenau is a relic of a bygone age, when Kreuzberg was vibrant hub of artists and activists, many of whom lived in vast squatter communes in abandoned houses. During the Cold War, the district was part of the neglected no man’s land near the Berlin Wall. Today, its location — a ten-minute bike ride from the Reichstag and Angela Merkel’s chancellery — has made it prime real estate. HG lives in this shop and the eviction (dated to August 9th) will force him to live on the street. Bizim Kiez and many other organisations try to prevent the eviction.